The specialty of the Italian company Tecnografica are large-format ceramic tiles. Our long-standing and loyal customer has now ordered his fifth scanner. Three scanners have already been installed at their site in Castellarano (Reggio Emilia), Italy, and another in their branch office in Spain. With regard to their long-term lasting good experience with CRUSE, Tecnografica has now decided for our favor once again – for the fifth time. We are very pleased to continue this trustworthy and excellent cooperation. This year, CRUSE Spezialmaschinen GmbH was represented at the Interzum trade fair in Cologne, the world’s leading trade fair for furniture manufacture and interior decoration. The two scan specialists for the decoration industry, the synchronous table (ST series) and the portal 2D + 3D, were presented to the expert public. Naturally true and high-resolution scans with detailed height information can be created with both scanners, which are available in different versions. 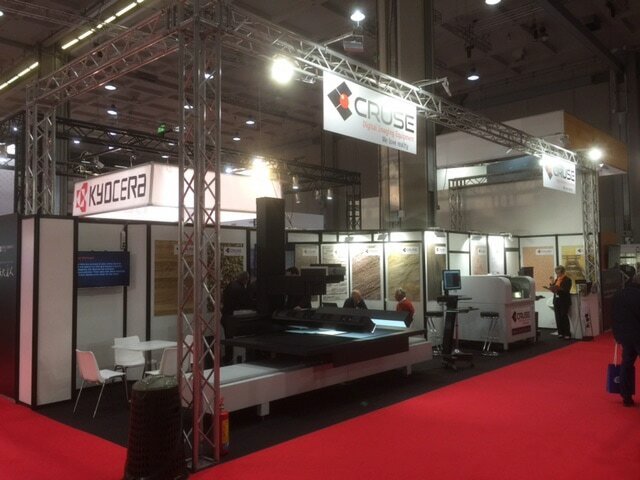 CRUSE also presented at Interzum the new CRUSE Design Studio, the software suite with proven scanning functionalities and various innovative tools for a smooth workflow. For more information about our large-format scanners and the CRUSE design studio please contact us Tel. +49 228 933975-0 or by mail:info@crusescanner.com.